Today’s video tutorial will show you how to make your own tow cables out of metal wire. Most model tank kits have their own plastic tow cables provided, generally pre-moulded in the shape to fit the pre-determined fixings on the tank’s hull. This is typical for German tanks, which had tow cable brackets welded to the hull in uniform positions. But some countries, such as the Soviets, tended to just drape the tow cables wherever they landed so long as they didn’t fall off as the tank moved. This sort of free-flowing cable is very difficult for kit manufacturers to reproduce realistically. Add in the issue of moulded-in seams on cables which are pretty much impossible to sand off without losing the braided texture. Suddenly, making your own metal tow cables makes sense, doesn’t it? The beauty of it is that they are ridiculously easy to make. All you need is some metal wire, a drill, and a pair of pliers. Your wire needs to be thick enough so that when three strands are braided together they will give you a diameter roughly the same as the kit’s plastic cable. And seriously, it takes no time at all. In the time it has taken you to read this post, you could be finished. Be safe - make sure you don’t over-wind your cable. Stop before it gets too taut, or it could snap with unpredictable and possibly unpleasant results. You don’t want metal wire under pressure slipping round the place. Keep the three lengths of wire the same length, and try to keep them equally taut when you start winding. You’ll see in my video that one of my wires was looser than the others, and it tightened at a slower rate. This caused little loops, little imperfections in my cable. 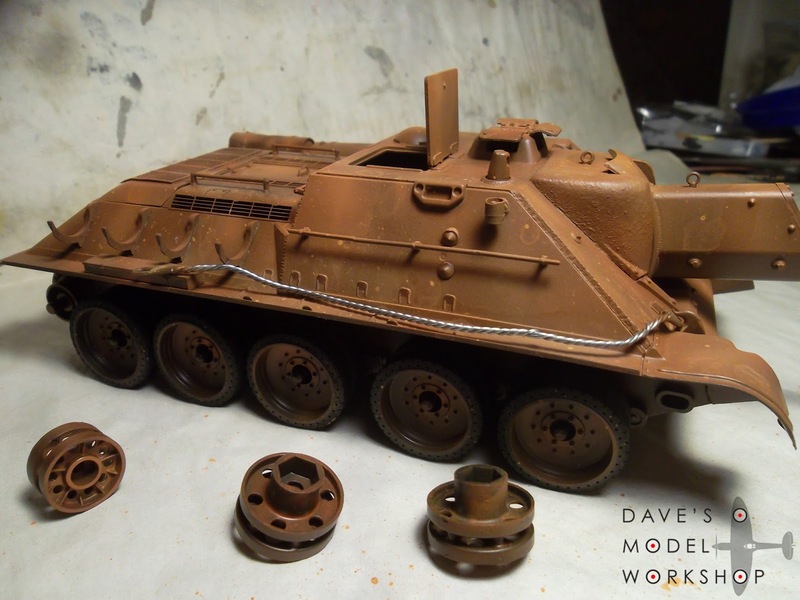 Easy to hide with some weathering (mud, a draped tarp, etc) but better avoided if you can. Anyway, enjoy, experiment and make your own. So much better than what you get in the box! Look at that brand new tow cable, shiny and new, just waiting to be weathered and aged.